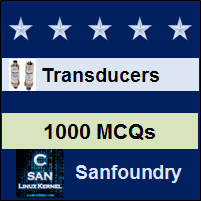 This set of Instrumentation Transducers Multiple Choice Questions & Answers (MCQs) focuses on “Inductive Transducers”. 1. Which of the following represents drawback of the inductive transducer for displacement measurement? Explanation: Electromagnetic force of attraction is acted on moving core, and hence displacement source has to overcome this force. 2. Which of the following represents the application of inductive transducers? Explanation: Inductive transducers can be used for measuring displacement and thickness of thin plate etc. Explanation: Push-pull system is a special type of coil system which has many advantages. 4. Closely wound toroid coils are better than solenoid coil. Explanation: Closely wound toroid coils provide independence from the effect of an external magnetic field. 5. Which of the following is correct for toroid type coils? Explanation: Toroid cannot be used for measuring linear displacement due to its shape. 6. Which of the following represents materials used for thickness measurement using inductive transducer? Explanation: Commonly all type of magnetic materials can be used for thickness measurement using inductive transducers. 7. Which of the following device can be used for measuring relative angular displacement between two systems? Explanation: Synchro is a device used for measuring angular displacement between two systems, usually in a machine between two shafts. 8. Which of the following is correct for synchro? Explanation: They develop induced emf related to the angular position of rotor, hence they are known as transformer type displacement transducer. 9. For thickness measurement, the material should have constant permeability and resistivity. Explanation: Material used for thickness measurement should have constant permeability and resistivity since properties of material should not change while measurement. Explanation: It has same function as linear potentiometers and is used for measuring displacement.